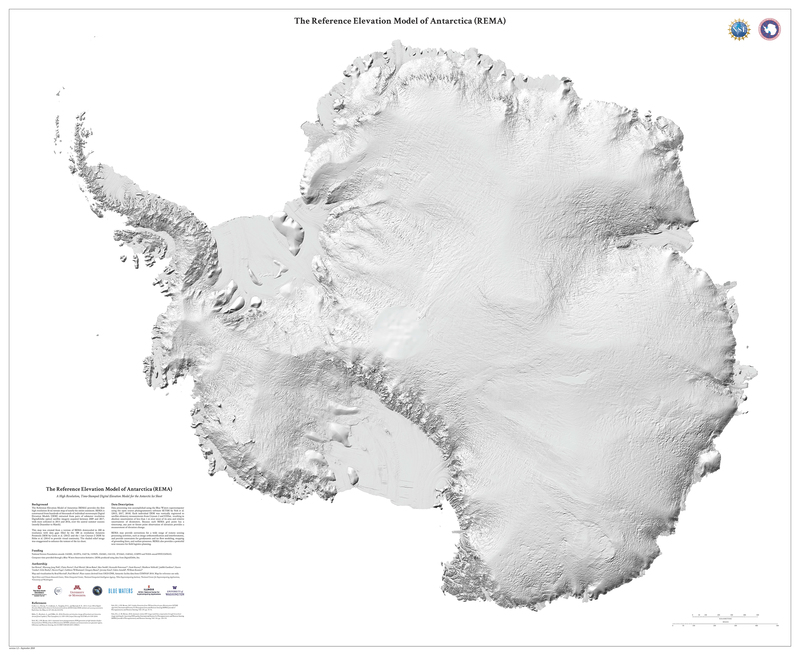 The Reference Elevation Model of Antarctica (REMA) is a high resolution, time-stamped Digital Surface Model (DSM) of Antarctica at 8-meter spatial resolution. Want to jump right to the data? We encourage you to read this documentation, but the link is provided below! The Reference Elevation Model of Antarctica (REMA) provides the first, high resolution (8-meter) terrain map of nearly the entire continent. Since each REMA grid point has a timestamp, any past or future point observation of elevation provides a measurement of elevation change. REMA may provide corrections for a wide range of remote sensing processing activities, such image orthorectification and interferometry, and provide constraints for geodynamic and ice flow modeling, mapping of grounding lines, and surface processes. REMA also provides a powerful new resource for field logistics planning. REMA is constructed from hundreds of thousands of individual stereoscopic Digital Elevation Models (DEM) extracted from pairs of submeter (0.32 to 0.5 m) resolution DigitalGlobe satellite imagery, including data from WorldView-1, WorldView-2, and WorldView-3, and a small number from GeoEye-1, acquired between 2009 and 2017, with most collected in 2015 and 2016, over the austral summer seasons (mostly December to March). Each individual DEM was vertically registered to satellite altimetry measurements from Cryosat-2 and ICESat, resulting in absolute uncertainties of less than 1 m over most of its area, and relative uncertainties of decimeters. Version 1 of REMA includes approximately 98% of the contiguous continental landmass extending to maximum of roughly 88°S. Besides the “pole hole” some voids exist. These, as well as all sub-Antarctic islands, will be covered in future versions of REMA. See the strip and mosaic tile status maps below for exact coverage areas. The REMA domain, shown in black, includes all land area south of 60°. Please note, coverage may not exist for all areas. REMA is generated by applying fully automated, stereo auto-correlation techniques to overlapping pairs of high-resolution optical satellite images. Using the open source Surface Extraction from TIN-based Searchspace Minimization (SETSM) software, developed by M.J. Noh and Ian Howat at the Ohio State University, stereopair images were processed to Digital Elevation Models using compute resources provided through an Innovation Allocation on the Blue Waters supercomputer located at the National Center for Supercomputing Applications at the University of Illinois at Urbana-Champaign. Output DEM raster files are being made available as both “strip” files as they are output directly from SETSM that preserve the original source material temporal resolution, as well as mosaic files that are compiled from multiple strips that have been co-registered, blended, and feathered to reduce edge-matching artifacts. The time-dependent nature of the strip DEM files allows users to perform change detection analysis and to compare observations of topography data acquired in different seasons or years. The mosaic DEM tiles are assembled from multiple strip DEMs with the intention of providing a more consistent and comprehensive product over larger areas, while also providing a time stamp and error estimate for each pixel to enable to change detection. The tile data are registered to satellite altimetry to increase their absolute accuracy while strips are not. Registration data for strips may be provided in later REMA versions. Refer to these documents and guides for official REMA information & citation. Along with acknowledging the PGC, the REMA dataset should be cited as follows. Howat, I. M., Porter, C., Smith, B. E., Noh, M.-J., and Morin, P.: The Reference Elevation Model of Antarctica, The Cryosphere, 13, 665-674, https://doi.org/10.5194/tc-13-665-2019, 2019. (1) A vertical offset of 39 cm was added to the 1086 8-m mosaic tiles registered to Cryosat-2 altimetry, as well as Antarctica-wide mosaics, to correct for biases induced by surface penetration and surface re-tracking. This correction was determined through comparison to ICESat-1 altimetry. (2) Incorrect No Data values were replaced in 288 of the 8-m mosaic tiles and the Antarctica-wide mosaics. REMA Release 1 includes mosaic tiles of 100 x 100 km generated at 8 meter posting, 8 meter posting strips and 2 meter posting strips for rock outcrops and other areas of interest. The sections below provide more detail of each product. For both strips and mosaics, an Esri shapefile is available as an index (footprint polygons), compatible with most GIS software. A download URL is provided in the fileurl attribute field which links directly to the zipped data. For bulk download, see the “Explore Data” section at the end of the page. Strip DEM files correspond to the overlapping area of the input stereoscopic imagery pair strips as they are collected by DigitalGlobe’s constellation of polar-orbiting satellites. Strip DEM dimensions will vary according to the satellite sensor that acquired the images and the off-nadir angle of collection. Most strips are between 13 km and 17 km in width, and 110 km and 120 km in length. Strip DEM files are provided at 2-meter or 8-meter spatial resolution in 32-bit GeoTIFF format. Elevation units are meters and are referenced to the WGS84 ellipsoid. No ground control or altimetry registration has been applied to the strips. REMA Strip Coverage (Release 1). Purple: 8 m, Blue: 2 m.
REMA Strip Density (Release 1). In addition to the individual time-stamped strips, REMA includes a mosaic for 100×100 km tiles. The mosaic tiles are generated at 8 meter posting. In addition to the complete 8 meter dataset, reduced-resolution, resampled versions are availbled at 100-meter, 200-meter, and 1-km resolutions. The reduced-resolution datasets have an alternate filled version. REMA Mosaic Coverage (Release 1). Hillshade representation images were generated for each DEM strip segment and these were visually inspected and classified based on visual quality (i.e. lack of erroneous surfaces due to clouds, shadows, etc). Images were either accepted, manually edited to mask erroneous surfaces, or rejected. All strips were registered to altimetry point clouds obtained from Cryosat-2 radar and ICESat GLAS laser campaign 2D (25 Nov. to 17 Dec., 2008). For Cryosat-2 registration, only vertical bias corrections with a 1-sigma uncertainty of less than 0.1 m and residuals with a standard deviation of less than 1 m were applied. For ICESat, only corrections with a vertical residual of less that 0.35 m were applied. Quality-controlled strip DEMs are mosaicked into 100 km by 100 km tiles with a 1-km wide buffer on each side to enable coregistration and feathering between tiles. For each tile, strips with altimetry registration are added first, in order of ascending vertical error, with a linear distance-weighted edge feather applied to the strip boundaries. The error value at each pixel is the registration error and the date stamp is the day of DEM acquisition. In areas where edges of strips have been feathered, the error and date stamp are averaged with the same weighting as the elevation. Once all registered strips have been added, unregistered strips are added to fill gaps and are coregistered to the existing, registered data in the mosaic. Each quality-controlled, unregistered strip overlapping a gap is tested for quality of coregistration, with the strip with the smallest coregistration residual selected to fill the the gap. Again, a distance weighted feathering is applied to smooth strip edges. If Cryosat-2 registered data are available within a tile, those data are used and any ICESat registrations are ignored. If neither Cryosat-2 or ICESat registered data are available, the quality-controlled strip with the most coverage of the tile is added first and serves as a relative reference. Unregistered strips are then coregistered to the mosaic and added as described above. Figure 2 shows the distribution of tiles registered to Cryosat-2, ICESat or alignment to neighbors. Tiles around the edge of the ice sheet, within the CryoSat-2 SARin mode zone, are mostly registered to contemporaneous Cryosat-2 altimetry with the exception of coast tiles with too little land surface or extensive crevassing that prevent successful altimetry registration. Most of the interior tiles are registered to ICESat and therefore have a nominal date stamp of late December 2008, although little or no secular surface elevation change is expected in these regions on sub decadal time scales. Some tiles missing registration, and thus registered through alignment, are found around the pole hole and along a narrow zone in to the northeast of the pole hole. Lack of registration in these cases was due to missing or lower quality DEM data, resulting in registration residuals larger than the threshold. Once the tile is complete, the tile is then registered to surrounding, registered tiles using the overlap provided by the edge buffer. Tiles edges are then feathered to smooth any offsets between tiles edges and then buffers are cropped. REMA elevation error, given by errors in registration, or co-registration in the case of alignment. source: Ian Howat, BPRC. REMA, represented by acquisition year of source imagery. Years range from 2010 to 2018. source: Ian Howat, BPRC. Finally, we apply a coastline mask using the British Antarctic Survey (BAS) land/ice classification polygons from the Antarctic Digital Database. Since this coastline is of a lower resolution and does not precisely match REMA in several areas, we buffered the coastline by 800 m and masked as all surfaces within the buffer that are less than 2 m from the local mean sea level. Esri has developed an online web mapping application to explore REMA data. The full-resolution REMA strips and mosaics are presented in this web map to quickly preview and explore the elevation data. With this web map, users can visualize the REMA data, preview the spatial coverage, and download simple exports. The REMA Viewer is the best way to preview the datasets if no GIS or remote sensing software is available or you simply want to explore the entire dataset quickly. The REMA Viewer, developed by Esri, allows for visualization and download of REMA products. NGA has also developed an online web mapping application to explore REMA data. The application features many of the same layers as the Esri REMA Viewer, but in a different interface. The NGA web application features many tabs which included separate map types and is useful for a spatial search of the REMA index to quickly download one-off DEMs, both strips and tiles. The NGA REMA Web App is useful for a spatial search and download of strips and tiles. There is no login required for either application, but if you download or use any REMA data from these sites (or otherwise), you must adhere to PGC’s Acknowledgement Policy. Use the links below to browse the directory for the entire REMA dataset. Refer to the User Documentation to see the directory structure, naming schemes, and download contents. Users familiar with the GNU Wget utility can use the following commands to batch download REMA data. Please note, the first two commands will download the entire archive, which is over 43 TB for geocells and 1 TB for mosaics. Use the subdirectory examples to limit your download. REMA tiles can be accessed via web mapping services provided by Esri. The raster elevation data are served via an Esri Image Service. We also provide an ArcGIS Online Feature Service for the REMA mosaic tile and strip indexes (no raster elevation is included in the index, just metadata and download links). The GIS layers can be used directly in desktop GIS software. The links below provide URLs to the web services and instructions for how to add and use the data in ArcGIS. Visit the ArcGIS Online item page(s) to download connection files or the indexes in many GIS formats (Esri shapefile, GDB, etc.). For other GIS software packages, consult the documentation. A shaded relief map poster of the REMA dataset with voids filled and the resolution reduced to 500 meters is available as a 44″x36″ map poster. There are two versions, one that contains cartographic elements such as place name labels, graticules, and facilities, and one that is just the shaded relief image. The maps can be downloaded below. If the above format isn’t large enough for you, a number of high resolution images have been created to be printed on a large-format plotter for display on a floor or a large wall. The full continent of Antarctica is available as three strips sized at 36″x132″ with a final size of 9’x11′ when fully assembled. The Antarctic Peninsula and the Thwaites/Pine Island Glacier area of West Antarctica are also available. All files are downloadable with the links below in .jpg format. Please note: file sizes may be up to 50 Mb.